What Facts Should I Know about ADHD in Children? What Is the History of ADHD in Children? What Are Symptoms and Signs of ADHD in Children? When Should Someone Seek Medical Care for Childhood ADHD? What Specialists Treat Childhood ADHD? What Tests Do Specialists Use to Diagnose ADHD in Children? Is ADHD in Children on the Increase? If So, Why? Can ADHD Be Seen in Brain Scans of Children With the Disorder? Can a Preschool-Aged Child Be Diagnosed With ADHD? What Is the Treatment for Childhood ADHD? What Medications Treat ADHD in Children? What Are the Risks of the Use of Stimulant Medication and Other Treatments in Children? What Are Other Forms of Therapy for Children With ADHD? Are There Ways to Prevent ADHD in Children? What Is the Prognosis for ADHD in Children? What is the medical definition of ADHD? Attention deficit hyperactivity disorder (ADHD) refers to a chronic biobehavioral disorder that initially manifests in childhood and is characterized by problems of hyperactivity, impulsivity, and/or inattention. Not all affected individuals manifest all three behavioral categories. What are the first signs of ADHD? These symptoms have been associated with difficulty in academic, emotional, and social functioning. The diagnosis is established by satisfying specific criteria, and the condition may be associated with other neurological conditions, significant behavioral problems (for example, oppositional defiant disorder), and/or developmental/learning disabilities. Therapeutic options included the use of medication, behavioral therapy, and adjustments in day-to-day lifestyle activities. ADHD is one of the more common disorders of childhood. Studies in the United States indicate that approximately 8%-10% of children satisfy the diagnostic criteria for ADHD. ADHD is diagnosed more in boys than girls. Can ADHD be cured or grown out of? While previously believed to be "outgrown" by adulthood, current opinion indicates that many children will continue throughout life with symptoms that may affect both occupational and social functioning. Some medical researchers note that approximately 40%-50% of ADHD-hyperactive children will have (typically non-hyperactive) symptoms that persist into adulthood. What are the 3 types of ADHD? Primarily inattentive: recurrent inattentiveness and inability to maintain focus on tasks or activities. In the classroom, this may be the child who is "spacing out" and "can't stay on track." Primarily hyperactive-impulsive: Impulsive behaviors and inappropriate movement (fidgeting, inability to keep still) or restlessness are the primary problems. Unlike the inattentive ADHD-type child, this individual is more often the "class clown" or "class devil" -- either manifestation leads to recurrent disruptive problems. Combined: This is a combination of the inattentive and hyperactive-impulsive forms. The combined type of ADHD is the most common. The predominantly inattentive type is being recognized more and more, especially in girls and in adults. The predominantly hyperactive-impulsive type, without significant attention problems, is rare. We are still learning about ADHD, and experts' understanding of the disorder is still being refined. Some believe, for example, that the term "attention deficit" is misleading. They maintain that people with ADHD are actually able to pay attention too well, rather than too little, but have difficulty regulating their attention, leaving them unable to properly focus. Others have trouble ignoring irrelevant details and/or focus so intensely on specific details that they miss the bigger and broader picture. Many ADHD sufferers cannot shift gears from one thing to another when they need to, leaving them unable to focus on what needs to be done. Extreme difficulty getting a child to stop playing a video game to come to dinner is a common example. Contrary to some media accounts, attention disorders are not new. Childhood hyperactivity was a focus of interest in the early 1900s. Today, hyperactivity, impulsivity, and inattention are the focus, but disability related to hyperactivity and distractibility has been alluded to throughout medical history. Historical figures of diverse backgrounds and accomplishment have demonstrated behavior compatible with ADHD. Mozart composed and remembered entire musical compositions but disliked the tedious task and attention to detail necessary when transcribing to paper. Einstein would spend hours and even days sitting quietly in a chair doing "thought experiments," including complex series of mathematical calculations and revisions. Ben Franklin failed in school due to his perfectionist and impulsive behaviors. He later mastered five languages (self-taught) and was highly respected as an author, scientist, inventor, and businessman (publisher). What is new is the greater awareness of ADHD thanks to rapidly mounting research findings. In the United States, ADHD affects about 8%-10% of children. Similar rates are reported in other developed countries such as Germany, New Zealand, and Canada. In most cases, the unusual behaviors are noticed by the time the child is about 7 years old, although ADHD is occasionally diagnosed for the first time in teenagers or young adults. Children with ADHD are often noted to be emotionally delayed, with some individuals having a delay in maturity of up to 30% when compared with their peers. Thus a 10-year-old student may behave like a 7-year-old; a 20-year-old young adult may respond more like a 14-year-old teenager. Boys are more likely than girls to be diagnosed with ADHD. At one time, the ratio of boys to girls with ADHD was thought to be as high as 4:1 or 3:1. This ratio has been decreasing, however, as more is known about ADHD. For instance, greater recognition of the inattentive form of ADHD has increased the number of girls diagnosed with the disorder. People identified with ADHD in adulthood are almost as likely to be women as men, suggesting that we may have been missing the diagnosis in many young girls. Approximately one-quarter of those with ADHD have significant learning disabilities, including problems with oral expression, listening skills, reading comprehension, and mathematics. There is disagreement over whether ADHD persists as children grow into adults. Some believe that most children simply grow out of ADHD. Others believe that ADHD persists into adulthood. About one-third of children with ADHD continue to have the disorder into adulthood. Hyperactive symptoms may decrease with age, usually diminishing at puberty, perhaps because people tend to learn how to gain greater self-control as they mature. Inattention symptoms are less likely to fade with maturity and tend to remain constant into adulthood. As we learn more about ADHD, certain subtypes will likely be found to cause more adult dysfunction than others. People with ADHD are much more likely than the general population to have other related conditions such as learning disorders, restless legs syndrome, ophthalmic convergence insufficiency, depression, anxiety disorder, antisocial personality disorder, substance abuse disorder, conduct disorder, and obsessive-compulsive behavior. People with ADHD are also more likely than the general population to have a family member with ADHD or one of the related conditions. The pathogenesis (cause) of ADHD has not been totally defined. One theory springs from observations regarding variations in functional brain-imaging studies between those with and without symptoms. Similar variations have been shown in studies of the structure of the brain of affected and unaffected individuals. Animal studies have demonstrated differences in the chemistry of brain transmitters involved with judgment, impulse control, alertness, planning, and mental flexibility. A genetic predisposition has been demonstrated in (identical) twin and sibling studies. If one identical twin is diagnosed with ADHD, there is a 92% probability of the same diagnosis in the twin sibling. When comparing nonidentical twin sibling subjects, the probability falls to 33%. Overall population incidence is felt to be 8%-10%. Genes that control the relative levels of chemicals in the brain called neurotransmitters seem to be different in ADHD, and levels of these neurotransmitters are out of normal balance. MRI and other imaging studies suggest that these imbalances occur in parts of the brain that control certain types of movement and executive functions. These areas of the brain may be smaller and/or less active in people with ADHD. The symptoms of attention deficit hyperactivity disorder (ADHD) are not physical symptoms such as ear pain or vomiting but rather exaggerated or unusual behaviors. The type and severity of symptoms vary greatly among people with ADHD. The severity of symptoms depends on the degree of abnormality in the brain, the presence of related conditions, and the individual's environment and response to that environment. The diagnostic criteria for ADHD are outlined in the Diagnostic and Statistical Manual of Mental Health, 5th ed. (DSM-V 2013) by the American Psychiatric Association. All of the symptoms of inattention, hyperactivity, and impulsivity must have persisted for at least six months to a degree that is maladaptive and inconsistent with the developmental level of the child. In addition, some hyperactive, impulsive, or inattention symptoms that cause present difficulties were present before 7 years of age and are present in two or more settings (at school [or work] or at home). There must be clear evidence of significant impairment in social, academic, or occupational functioning, and the symptoms are not entirely caused by another severe physical disorder (for example, severe illness associated with chronic pain) or mental disorder (for example, schizophrenia, other psychotic disorders, severe disabling mood disorders, etc.). Inattention symptoms are most likely to manifest at about 8 to 9 years of age and commonly are lifelong in duration. The delay in onset of inattentive symptoms may reflect its more subtle nature (versus hyperactivity) and/or variability in the maturation of cognitive development. Hyperactivity symptoms are usually obvious by 5 years of age and peak in severity between 7-8 years of age. With maturation, these behaviors progressively decline and generally have been "outgrown" by adolescence. Impulsive behaviors are commonly linked to hyperactivity and also peak at about 7-8 years of age; however, unlike their hyperactive counterpart, impulsivity issues remain well into adulthood. Impulsive adolescents are more likely to experiment with high-risk behaviors (drugs, sexual behavior, driving, etc.). Impulsive adults have a higher rate of financial mismanagement (impulse buying, gambling, etc.). Many children without ADHD may also demonstrate one or more of these behaviors. However, the difference between these children and the child with ADHD is that the behaviors are disruptive, are considered inappropriate for the child's developmental stage, persist for months or years, and occur both at home and at school. A child with ADHD almost never exhibits all of the symptoms, but the symptoms that are present appreciably hinder the child's social, psychological, and/or educational development. The behaviors of ADHD can mimic mood disorders (for example, bipolar disorder or depression), anxiety, or personality disorder. Those conditions must be ruled out or adequately treated before a definitive diagnosis of ADHD can be made. 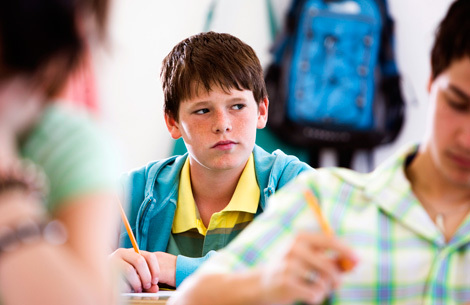 Has shorter attention span than peers and needs frequent teacher intervention to keep on task. Parents will often report the need for constant surveillance during homework. Evaluation and treatment of a child with ADHD can generally be handled by the child's pediatrician. A thorough history and complete physical exam are prerequisite to establishing the correct diagnosis. Should educational testing be indicated, this may be done utilizing an educational psychologist via the school district or by private means. Some children with ADHD have associated complicating medical or behavioral health issues (for example, bipolar disorder, dyslexia, etc.) and specialty evaluation may be indicated. Such specialists would include a pediatric neurologist, pediatric psychologist, or psychiatrist. The evaluation of a child suspected of having ADHD is multidisciplinary, involving comprehensive medical, developmental, educational, and psychosocial evaluations. Interviewing parents and the patient along with contact with the patient's teacher(s) is crucial. Investigation regarding the family history for behavioral and/or social problems is helpful. While direct person-to-person contact is considered vital at the outset of an investigation, follow-up studies may be guided by comparing standardized questionnaires (from parents and teachers) completed prior to intervention and subsequent to medication, behavioral therapy, or other treatment approaches. While there is no unique finding on the physical exam in patients with ADHD, unusual physical features should prompt consideration of consultation with a geneticist due to the high association with ADHD behavioral patterns and well-recognized genetic syndromes (for example, fetal alcohol syndrome). At this time, no lab test, X-ray, imaging study, or procedure is known to suggest or confirm the diagnosis of ADHD. Specific tests may be ordered if indicated by specific symptoms. Physicians and parents should be aware that schools are federally mandated to perform an appropriate evaluation if a child is suspected of having a disability that impairs academic functioning. This policy was strengthened by regulations implementing the 1997 reauthorization of the Individuals With Disabilities Act (IDEA), which guarantees appropriate services and a free, appropriate public education to children with disabilities from ages 3 to 21. If the assessment performed by the school is inadequate or inappropriate, parents may request that an independent evaluation be conducted at the school's expense. Furthermore, some children with ADHD qualify for special-education services within the public schools, under the category of "Other Health Impaired," although not all children with an established diagnosis of ADHD will qualify for special services based upon school district testing. If a child is deemed in need of special services, the special-education teacher, school psychologist, school administrators, classroom teachers, along with parents, must assess the child's strengths and weaknesses and design an Individualized Education Program (IEP). These special-education services for some children with ADHD are available through IDEA. Despite this "federal mandate," the reality is that many school districts, because of underfunding or understaffing, are unable to perform an "appropriate evaluation" for all children suspected of having ADHD. The districts have the latitude to define the degree of "impairment of academic functioning" necessary to approve "appropriate evaluation." This usually means the children who are failing or near-failing in their academic performance. A very large segment of the ADHD-affected children will be "getting by" (not failing) academically (at least in their early years of school), but they are usually achieving well below their potential and getting more and more behind each year on the academic prerequisite skills necessary for later school success. Thereafter, further educational testing may be requested from the school district. Unfortunately, some families will have to assume the financial burden of an independent educational evaluation. These evaluations are commonly done by an educational psychologist and may involve approximately eight to 10 hours of testing and observation spread out over several sessions. A primary goal of an educational evaluation is to exclude/include the possibility of learning disorders (for example, dyslexia, language disorders, etc.). Research has shown that ADHD does seem to cluster in families. Several investigations have demonstrated that children who have ADHD usually have a least one close relative (child or adult) who also has ADHD. At least one-third of all fathers who have ADHD will produce a child with ADHD. With the newer realization that adults may also experience ADHD symptoms, it is not unusual to have a parent's "problem at my job" be credited to ADHD -- often at the same time that their child's diagnosis is being established! Lastly, several studies have demonstrated a number of genes that may reflect a role in altered brain neurochemistry that provides a physiologic basis for this disorder and inheritance pattern. No one knows for sure whether the prevalence of ADHD per se has risen, but it is very clear that the number of children identified with the disorder and who obtain treatment has risen over the past decade. Some of this increased identification and increased treatment-seeking is due in part to greater media interest, heightened consumer awareness, and the availability of effective treatments. Teachers are better trained to recognize the condition and suggest that the family seek help, especially in the more mild to moderate cases. The condition itself is so much more clearly defined and more concisely diagnosed now. The diagnosis of ADHD is also less of a social stigma than in the past. This more enlightened perspective reflects the understanding that ADHD is a biochemical disorder and not merely an "out of control child." As such, more parents are receptive to medical therapy for the condition rather than resorting to less effective home/school discipline techniques. Interestingly, the increase in prevalence of ADHD is not solely an American phenomenon but has been noted also in other countries. Whether the number of patients with ADHD has truly increased or rather our better recognition and acceptance of ADHD as a diagnosis has "increased" remains to be further defined. Neuroimaging research has shown that the brains of children with ADHD differ fairly consistently from those of children without the disorder in that several brain regions and structures tend to be smaller. There is also a lack of expected symmetry between the right and left brain hemispheres. Overall, brain size is generally 5% smaller in affected children than children without ADHD. While this average difference is observed consistently, it is too small to be useful in making the diagnosis of ADHD in a particular individual. In addition, there appears to be a link between a person's ability to pay continued attention and measures that reflect brain activity. In people with ADHD, the brain areas that control attention appear to be less active, suggesting that a lower level of activity in some parts of the brain may be related to difficulties sustaining attention. It is important to reiterate that these laboratory observations are not yet sufficiently sensitive or specific enough to use to establish or confirm the diagnosis of ADHD or to monitor the effectiveness of treatment. The diagnosis of ADHD in the preschool-aged (under 5 years old) child is possible, but it can be difficult and should be made cautiously by experts well trained in childhood neurobehavioral disorders. A variety of physical problems, emotional problems, developmental problems (especially language delays), and adjustment problems can sometimes imitate ADHD in this age group. It is certainly not mandatory that the preschool-aged child showing ADHD-suggestive symptoms be placed in a preschool. The first line of therapy for children of this age showing ADHD-like symptoms is not stimulant medication therapy but rather environmental or behavioral therapy. This type of therapy can be carried out in the home with appropriate training supplied to the parents. If the child is to be placed in a preschool, the caretakers must be equally trained in the techniques of behavioral therapy. Stimulant therapy can reduce oppositional behavior and improve mother-child interaction, but it is usually reserved for severe cases or used when a child does not respond to environmental or behavioral interventions. The two major components of treatment for children with attention deficit hyperactivity disorder (ADHD) are behavioral therapy and medication. Home and school interventions: Parents can help their child's behavior with specific goals such as: (1) maintaining a daily schedule, (2) keeping distractions to a minimum, (3) setting small and reasonable goals, (4) rewarding positive behavior, (5) using charts and checklists to keep a child "on task," and (6) finding activities in which the child will succeed (sports, hobbies). Children with ADHD may require adjustments in the structure of their educational experience, including tutorial assistance and the use of a resource room. Many children function well throughout the entire school day with their peers. However, some patients with ADHD will benefit from a "pull-out session" to complete tasks, review specific homework assignments, and develop "management" skills necessary for higher education. Extended time for class work/tests may be necessary as well as assignments written on the board and preferential seating near the teacher. If necessary, an IEP (Individualized Educational Program) should be developed and reviewed periodically with the parents. ADHD is considered a disability falling under U.S. Public Law 101-476 (Individuals With Disabilities Education Act or IDEA). As such, individuals with ADHD may qualify for "appropriate accommodations within the regular classroom" within the public-school system. In addition, the Americans With Disabilities Act (ADA) indicates that secular private schools may be required to provide similar "appropriate accommodations" in their institution. Psychotherapy: ADHD coaching, a support group, or both can help teens feel more normal and provide well-focused peer feedback and coping skills. Counselors such as psychologists, child and adolescent psychiatrists, behavioral/developmental pediatricians, clinical social workers, and advanced practice nurses can be invaluable to both the children and families. Behavior modification and family therapy are usually necessary for the best possible outcome. The medications used to treat ADHD are psychoactive. This means they affect the chemistry, and thus the functioning, of the brain. Psychostimulants are by far the most widely used medications in treating ADHD. When used appropriately, approximately 80% of individuals with ADHD show a very good to excellent response in reduction of symptoms. These medications stimulate and increase activity of areas of the brain with neurotransmitter imbalances. The exact mechanism of how these drugs relieve symptoms in ADHD is unknown, but these medicines are linked to increases in brain levels of the neurotransmitters dopamine and norepinephrine. Low levels of these neurotransmitters are linked to ADHD. The most common adverse effects occur over the short term. They include loss of appetite, sleep disturbances, rebound (for example, agitation, anger, lethargy as the last dose starts to wear off), and mild anxiety. Most individuals who take psychostimulants for ADHD build up tolerance to adverse effects within a few weeks. Individuals with certain coexistent psychiatric disorders (for example, psychosis, bipolar disorder, some disorders of anxiety or depression) are particularly vulnerable to adverse effects if they do not receive appropriate concurrent treatment for the coexistent condition. Atomoxetine (Strattera) is a non-stimulant used to treat ADHD. This medication has been used for fewer years than the stimulants, and less is known about its long-term side effects. This drug has several benefits over stimulants, but its use may also carry several negative aspects. It is not a controlled substance and is not considered a drug of potential abuse by the U.S. Food and Drug Administration (FDA). Since it is not a controlled substance, pharmacies may accept phone-requested medical refills. It is usually taken only once a day for full 24-hour effectiveness. It is much less likely than stimulants to disrupt eating or sleeping. For some children, atomoxetine is not enough to control their ADHD symptoms. Many other children do very well on this medicine alone. Specialists treating individuals with ADHD have found Strattera seems to best help improve the problems associated with a disruption in executive function skills. Inattention and hyperactivity symptoms are less responsive. When starting Strattera therapy, a gradually increasing dosage schedule is recommended. It may take up to three weeks before full therapeutic benefit is achieved. For this reason, patients may need to remain on previously prescribed stimulant medication during the "build up" phase. In addition, Strattera must be taken daily; short-term "medication holidays" (for example, school vacations and weekends) will limit Strattera's efficacy. Studies have indicated a higher than expected incidence of suicide ideation during early treatment. This occurred in patients with pure ADHD as well as in those patients with ADHD accompanied by other emotional disorders (for example, depression, anxiety, bipolar disorder). Some medications originally developed to treat depression (antidepressants) also have important roles in treating some individuals with ADHD. Since these medicines have been used for many years to treat other mental-health conditions, their adverse effects are well understood. Other medicines that were originally developed to treat high blood pressure (alpha agonists) may also be useful in the treatment of those having ADHD. Again, due to widespread and long-term use, their side effects are well known to doctors. Guanfacine (Tenex, Intuniv): Recently, the U.S. FDA has licensed the use of guanfacine as a non-stimulant medication effective in treating ADHD when used in conjunction with other stimulant medications. It is not felt to be nearly as effective when used as a sole agent. Both a short-term preparation (Tenex) and a long-term preparation (Intuniv) are available. Unfortunately, 18% of Intuniv users discontinued use of their medication due to side effects, including drowsiness (35%), headache (25%), and fatigue (14%). Stimulant medications have been successfully used to treat patients with ADHD for more than 50 years. This class of medication, when used under proper medical supervision, has an excellent safety record in patients with ADHD. In general, the side effects of the stimulant class of medications are mild, often transient over time, and reversible with adjustment in dosage amount or interval of administration. The incidence of side effects is highest when administered to preschool-aged children. Common side effects include appetite suppression, sleep disturbances, and weight loss. Less common side effects include an increase in heart rate/blood pressure, headache, and emotional changes (social withdrawal, nervousness, and moodiness). Patients treated with the methylphenidate patch (Daytrana) may develop a skin sensitization at the site of application. Approximately 15%-30% of children treated with stimulant medications develop minor motor tics (involuntary rapid twitching of facial and/or neck and shoulder muscles). These are almost always short lived and resolve without stopping the use of medication. A recent investigation studied the possibility of stimulant medication used to treat ADHD and cardiovascular side effects. Concern focused on a possible association with heart attack, heart rate and rhythm disturbances, and stroke. At this time, there is no certainty in a proposed relationship to these events (including sudden death) when medication is used in a pediatric population screened for prior cardiovascular symptoms or structural pathology of the heart. A positive family history for certain conditions (for example, unusual heart rhythm patterns) may be considered a risk factor. The current position of the American Academy of Pediatrics is that a screening EKG is not indicated before the initiation of stimulant medication in a patient without risk factors. "Diversion" is the transfer of medication from the patient for whom it was prescribed to another individual. Several large studies have indicated that 5%-9% of grade and high school students and 5%-35% of college-aged individuals reported use of non-prescribed stimulant medication, and 16%-29% of students for whom stimulant medications were prescribed reported being approached to give, trade, or sell their medication. Misuse was more frequently seen in whites, members of fraternities and sororities, and students with a lower GPA. Diversion was more likely with the short-acting preparations. The most common reasons cited for use of non-prescribed stimulants were "helped with studying," improved alertness, drug experimentation, and "getting high." ADHD is a controversial diagnosis for several reasons. Many well-meaning individuals have spoken out against making children behave according to a norm or taking medications for the sake of improving grades. These individuals have expressed concern about addiction or drugging children. This kind of concern is valid; however, the following must also be considered. The negative consequences of not using medication for children with ADHD have to be weighed against the known risks. Long-term outcome studies have now been conducted with large numbers of adults diagnosed with ADHD as children, and one clear finding is that those who received medication for their disorder in childhood are more functional and have a better quality of life as adults than those who had the symptoms of the disease but did not receive medicine. Stimulants used for ADHD do not cause addiction. Although tolerance usually develops for the stimulant-associated effects of anorexia, insomnia, or mild euphoria, tolerance does not develop to the increased levels of neurotransmitters. These medications should not be used just to improve grades or quiet down classrooms. School performance should be looked at as a sign of how well the child is doing, just like other areas of health. These medications often improve school performance dramatically, which is linked to better social skills and heightened self-esteem. But grades should be a marker, not a goal. Studies that have examined whether taking a psychostimulant for ADHD in childhood contributes to future substance abuse have shown this to not be the case. In fact, in one very large study, children who received stimulant medication for ADHD had half the risk of future substance abuse of similar children with ADHD who did not receive medication. The use of psychostimulants in children should be scrutinized carefully. Fortunately, methylphenidate (Ritalin [and its long active formulation, Concerta], historically the most widely prescribed medication for ADHD) has been available for many years. This long period of clinical experience has shown that this is one of the safest medications used in children. No specific food or diet has been clearly shown to have a significant positive or negative effect on the symptoms or course of ADHD. People with ADHD should eat a healthy diet and probably avoid caffeine. That having been said, if the family's experience with a person having ADHD is that some sort of dietary change, such as decreased refined sugar intake, helps, then if the person is not deprived of necessary nutrients, there is certainly no harm in trying to follow such a plan. A good rule of thumb is to discuss the plan with the family doctor or whoever is providing the primary treatment for the ADHD symptoms. Regular physical activity has been shown to play an important role in some of the common related conditions (for example, depression, anxiety) and to improve concentration. Regular exercise may be beneficial in people with ADHD. Several studies on children with ADHD not taking medication have shown an improvement in concentration and reduction in inattentive and hyperactive behaviors if one hour of vigorous after-school play occurs before starting homework. CAM (complementary and alternative medicine) therapies are considered and/or tried in over half of patients with ADHD. Many times these modalities are used covertly and it is important for the treating physician to inquire about CAM to encourage open communication and review the risks versus benefits of such an approach. CAM treatment modalities incorporating vision training, special diets and megavitamin therapy, herbal and mineral supplements, EEG biofeedback, and applied kinesiology have all been advocated. The benefits of these approaches, however, have not been confirmed in double-blinded controlled studies. Families should be aware that such programs might require a long-term financial commitment that may not have insurance reimbursement as an option. Recent research on the benefits of specific polyunsaturated fatty acid (EPA and DHA) supplementation has demonstrated a therapeutic benefit in several well-designed studies. Further research in this area will hopefully shed light on how these supplements work. The primary-care provider, behavioral pediatrician, or child and adolescent psychiatrist will want to see the caregiver and the child often at first to monitor progress and response to therapy. Once the individual's condition is stabilized, follow-up visits will be regular but less frequent. The frequency of follow-up visits is quite variable and is dictated by the person's characteristics and convenience, provider experience, and use of psychotherapy. Follow-up visits every four to 12 weeks are often appropriate for the first year. After that, visits every three to four months for medication assessment may be adequate for a person whose condition is stable. Behavioral therapy may need to be ongoing for months or years. Federal and state laws grant special educational accommodations for children with ADHD and learning disabilities. Local school districts and regional/state departments of education can provide specific resources available in the local community. No clear methods for preventing ADHD are currently known. While some people have suggested that certain diets, teaching or parenting methods, or other approaches may keep ADHD from developing, unfortunately, none of these approaches has stood up to rigorous scientific testing so far. On the other hand, once the symptoms have begun and careful assessment has produced an ADHD diagnosis, various specific behavioral and learning techniques can be used by teachers and family to help get symptoms under better control. These should be discussed with the treating doctor so that the right interventions can be applied for the specific person. Literature supports the clinical observation that 40%-50% of children with ADHD will have symptoms persist into adulthood. One caveat needs to be mentioned -- many studies previously conducted focused on a patient population of males who were evaluated or treated by psychiatrists/psychologists or in clinics specially developed for such a patient population. The value of generalizing these results to the entire patient population with ADHD should be done with caution. Fortunately, new studies are being conducted to address this issue. Education: Follow-up studies of children with ADHD growing into adolescence showed impairment of academic success. A few studies into adulthood have demonstrated persistence of these findings. Completion of expected schooling, lower achievement scores, and failure of courses are areas of concern. Employment: The rate of adult employment of those with and without a diagnosis of ADHD did not vary; however, those with ADHD did have occupations with a lower "job status." Socialization issues: As noted above, a significant subset of children with ADHD has accompanying disruptive behavior disorders (oppositional defiant disorder or conduct disorder, ODD and CD). In studies that followed children with ADHD into adulthood, between 12%-23% have socialization problems, versus 2%-3% of the general population. Substance abuse: Studies examining whether those with ADHD have a higher likelihood for such high-risk behaviors are controversial. The largest study to date supports other smaller studies that indicate ADHD patients who consistently take their medication have twice the likelihood of not using drugs or excessive alcohol. Driving: A teen with ADHD is two to four times more likely to have a motor-vehicle accident or have his/her license suspended than a peer without such a diagnosis. Impulsivity and inattention again seem to be limited when at-risk teens consistently take their recommended medication. Attention deficit hyperactivity disorder (ADHD), whether it affects an adult or a child, brings many challenges. People with ADHD can learn, achieve, succeed, and create a happy life for themselves with effort. But making changes is not always easy. Sometimes it helps to have someone to talk to. This is the purpose of support groups. Support groups consist of people in the same situation. They come together to help each other and to help themselves. Support groups provide reassurance, motivation, and inspiration. They help individuals see that their situation is not unique and not hopeless, and that gives them power. They also provide practical tips on coping with ADHD and navigating the medical, educational, and social systems that people will rely on for help for themselves or their child. Being in an ADHD support group is strongly recommended by most mental-health professionals. Support groups meet in person, on the telephone, or on the Internet. To find a support group that works for you, contact the following organizations. You can also ask a health-care professional, behavioral therapist, education specialist, or look on the Internet. Work together as a team. This means that parents, educators, tutors, therapists, and others involved in the care of the child should be on the same page regarding treatment plans and goals. Sharing information with the others involved in your child's care is essential to ensure that he or she receives needed support. Treat your child's teachers as allies and work together for optimal outcomes at home and in the classroom. ADHD Practice Guideline for the Diagnosis, Evaluation and Treatment of Attention Deficit Hyperactivity Disorder in Childhood and Adolescence. Subcommittee of the American Academy of Pediatrics: Steering Committee on Quality Improvement and Management. Pediatrics 128 (2011): 1007. Biederman, J., et al. "Do Stimulants Protect Against Psychiatric Disorders in Youth With ADHD? A 10-Year Follow-up Study." Pediatrics 124.1 July 2009: 71-78. What treatment has been effective for your child's ADHD? Please describe the severity of your child's ADHD symptoms. Please describe your experience with ADHD. What tests were used to diagnose your child's ADHD?